Win a free Encore Task Chair! 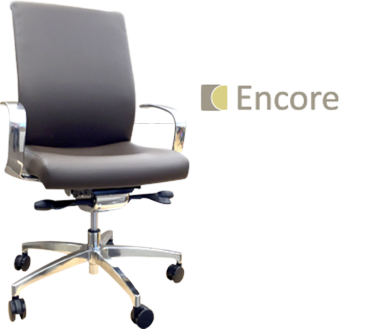 At QGC Interiors we believe so strongly in helping people create a better workplace experience we are willing to give-away a new Encore task chair for free! It’s our way of helping potential clients get a good start in creating a better workplace for themselves. This opportunity will not last long. Simply fill out the entry form with a few details and you’ll be entered to win. There is no purchase necessary and you are under no obligation to purchase in the future. We are excited to hear from you and look forward to starting your better workplace experience today! Raising the benchmark in design, comfort and quality, Encore is a leading provider of contemporary options-oriented seating and table products. Your email will not be shared with anyone outside our walls. If you walked into an ice cream store and all they served was chocolate and vanilla, you'd probably turn around and walk out. That is unless you thought that chocalate and vanilla was the only ice cream ever invented and there was nothing even conceivable you should try. Thankfully, that's not our reality and we have a whole world of flavors that continues to grow and evolve.